Lovely, a stunning plant. More photos here. 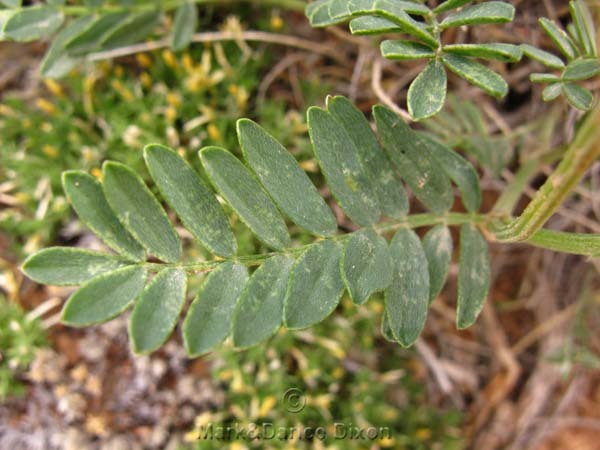 Short's Milkvetch is one of 419 species in the genus Astragalus, per the USDA plant database website. WIKIPEDIA puts the nubmer at closer to 2,000! Some species are toxic in varying amounts but a study of this member has not been done specifically. Plant location: Seen on a hike in West Pawnee Butte Colorado on June 3, 2009. This very lovely specimen is found only in these United States: CO, NE, NM, WY. More photos here. Bloom period: April through June. More photos here. 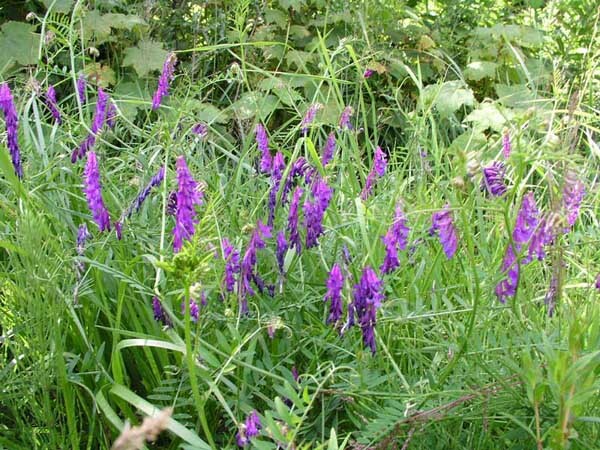 This perennial herb is classed by William Weber as the only member in the genus Quincula. THANK YOU TO DR. MARY DUBLER for this identification!! It is also known to be placed in the genus Physalis. 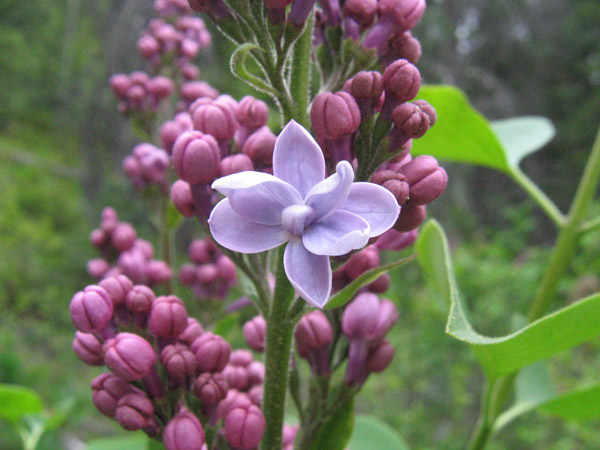 The blooms can be white, blue, or purple, most often purple. The plants share good company, as memebers of the family include many valuable food sources such as the potato, eggplant, tomatos, and peppers. The family also, however, includes a fair number of toxic members as well. Per WIKIPEDIA is this: 'Solanaceae species are often rich in alkaloids whose toxicity to humans and animals ranges from mildly irritating to fatal in small quantities.' End quote. 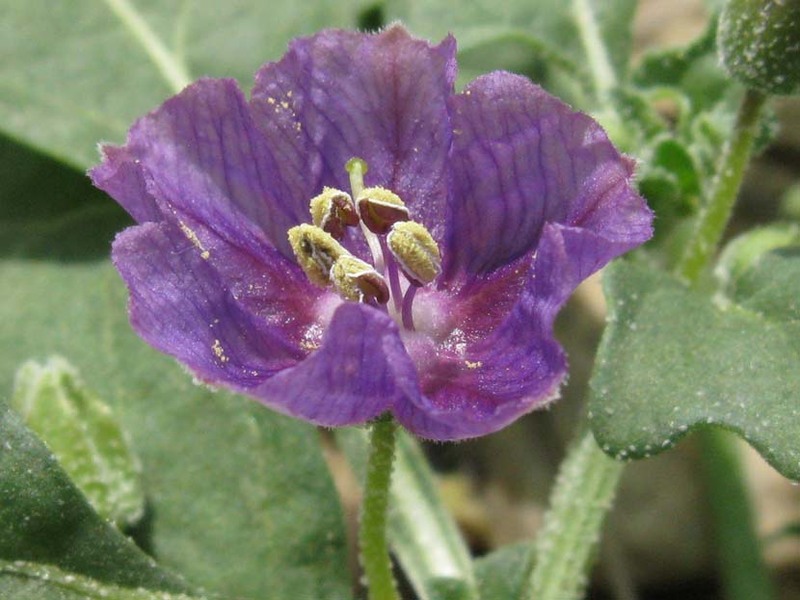 The plant is said to be easily confused with members of Physalis and Solanum. Any experimentation with the plant for food should be tested carefully for adverse reactions. Plant location: Adams County Open Space, September 11, 2008. The plants grow in the following United State: AZ, CA, CO, KS, NM, NV, OK, TX, UT. Habitats are for example forest openings, fields (as was this example) and hillsides. Bloom period: A generous amount of time is available to see these blooms - March through October. See WIKIPEDIA for a detailed account of the changes. 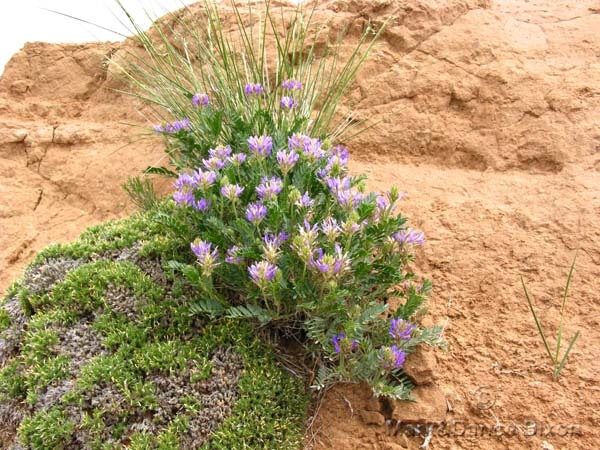 Plants found from southern British Columbia south to the east of the Cascades in central Washington to the Columbia River Gorge and east across central Idaho to Montana, and Wyoming. Get an excellent book, NORTHWEST PENSTEMONS (see a review in our bibliography here), for more information. You will learn that there are 272 species of Penstemons that are native to North America and that there are approximately 80 species at home in the Pacific Northwest. This is the largest genus of flowering plants endemic to North America We have seen many species of Penstemons. Some even look a bit like exotic orchids. 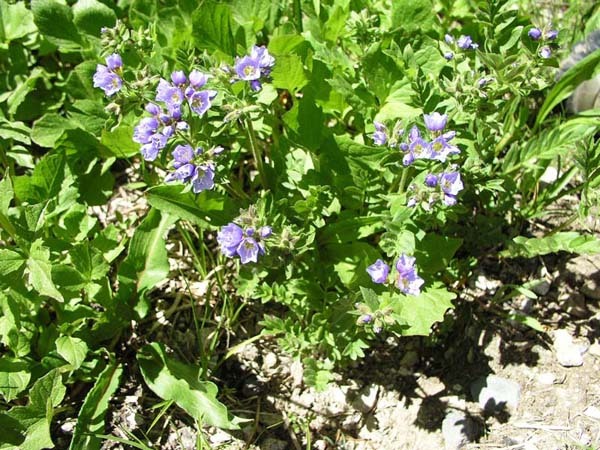 USES: According to Wikipedia, Native Americans used Penstemons for treating toothaches. The website Native American Ethnobotany details many more uses, amoung them: cures of a love medicine by the Iroquois; Infusion of plant tops used for sore and itchy scalp and to bathe the skin for acne and pimples by the Okanagan-Colville tribes; Decoction of leaves used as an eyewash for sore, red eyes by Thompsons tribes. For a complete list enter Penstmon fruticosus here and press your enter key. A look at WIKIPEDIA'S Penstemons is worthwhile. They have many pictures of various species of Penstemons as well as an extensive listing of species by scientific names. Plant location: This was growing in the Cle Elum Washington area. June 9, 2007 Bloom season: This species shows itself off from May through August. The double blossom is especially beautiful, the stamens in such specimens have been replaced by extra petals. Indeed there are none showing in our specimen. We obviously caught our example early in it's season and were lucky to have seen even that single lovely flower. The common lilac is known to bloom heavily ONLY every other year. Manipulation of the plant (cutting of stems and/or blossoms) at specific times in the plant's season can effectively change the flowering performance of the plant, a common practice with cultivated plants. Plant location: Hiking Ingalls Creek, Washington state, on May 19, 2007. Our plant view is not especially good. We were not taking technical photographs at that time. We would love to return to Washington state and do this hike again at peak wildflower season. The trail was fantastic for blooms. In the US and Canada WIKIPEDIA has the following locations for this plant: USA (AR, CO, CT, DC, IA, IL, IN, KS, KY, MA, MD, ME, MI, MN, MO, NC, NH, NJ, NY, OH, OR, PA, RI, SD, TN, UT, VA, VT, WI, WV), CAN (BC, NB, NS, ON, PE, QC, SK). BUT our sighting proves out that Washington state also supports Lilac. 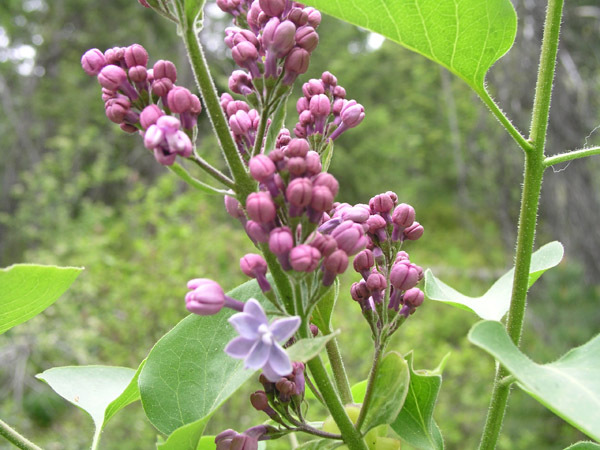 Lilac is the state flower of the state of New Hampshire. Bloom season: Unknown. Per WIKIPEDIA: 'Lamiaceae or Labiatae, also known as the Mint family, is a family of plants in about 210 genera and some 3,500 species. The plants are frequently aromatic in all parts and include many widely used culinary herbs, such as basil, mint, rosemary, sage, savory, marjoram, oregano, thyme, lavender, and perilla. Some are shrubs, but rarely trees or vines. Many members of the family are widely cultivated, owing not only to their aromatic qualities but also their ease of cultivation: these plants are among the easiest plants to propagate by stem cuttings. Besides those grown for their edible leaves, some are grown for decorative foliage, such as coleus and snow-on-the-mountain. Others are grown for food purposes, but seeds are utilized instead of leaves, such as with chia.' End quote. This beautiful little plant often is one of the first blooming in the spring and was first only a cultivar. But it escaped it's controlling boundaries is now common in the wild. More photographs of Glecoma hederacea are at Turner Photographics. Turner Photographics is the website of author Mark Turner. See our review of his book Wildflowers of the Pacific Northwest co-authored with Phyllis Gustafson. Plant location: Seen in Maple Valley, Washington in mid June 2007. Bloom period: March through June. One word - SHOWY! These distinctive and beautiful flowers caught our eye on a slope not too far from a little stream in a Colorado Open Space. The species is native to North America and has become popular as a cultivated plant. It holds a strong attraction for the pollinators bees, butterflies, and hummingbirds and so is a wonderful choice for the gardens of those who wish to draw these creatures to their gardens. The long bloom period doesn't hurt either. 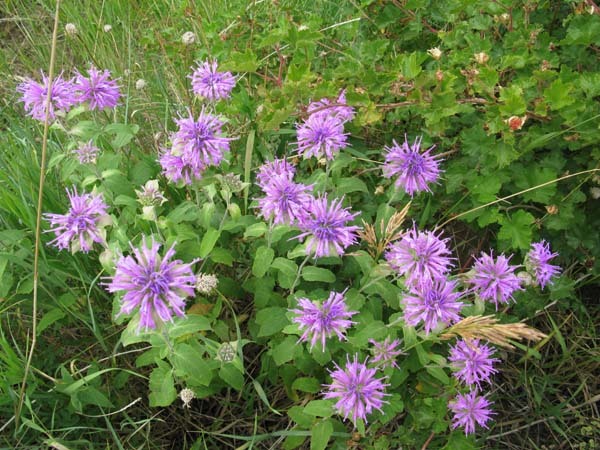 There are only about 16 species in the Monarda genus. 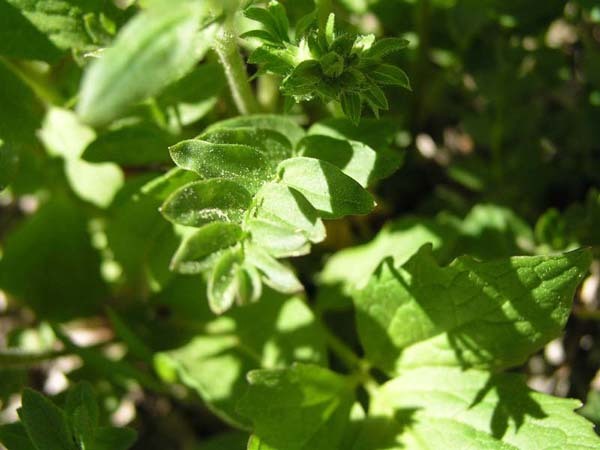 In flavor, the plants from this genus are described as having a flavor close to oregano when used as a seasoning with cooked foods. It is considered a good companion plant to grow with tomatoes, allegedly improving both the health and flavor of them. In all species, the leaves, when crushed, exude a spicy, highly fragrant oil. Of the species listed, M. didyma (Oswego Tea) contains the highest concentration of this oil. This is per WIKIPEDIA. Also they say that the genus was named for Nicol?s Monardes who wrote a book in 1574 describing plants found in the New World. More photographs of Wild Bergamot here. USES: The plants are not only lovely to look at but offer a long and current history of medical and nutritional uses. 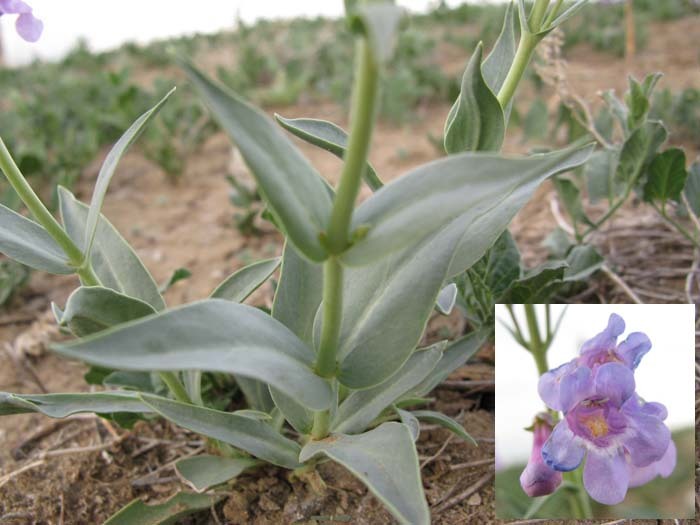 The USDA NRCS National Plant Data Center website has an excellent paper on this species. From it is this: 'The Tewa Indians because of the flavor it imparted cooked Wild bergamot with meat. The Iroquois used the plant in the making of a beverage. The plant has a wide variety of medicinal uses. 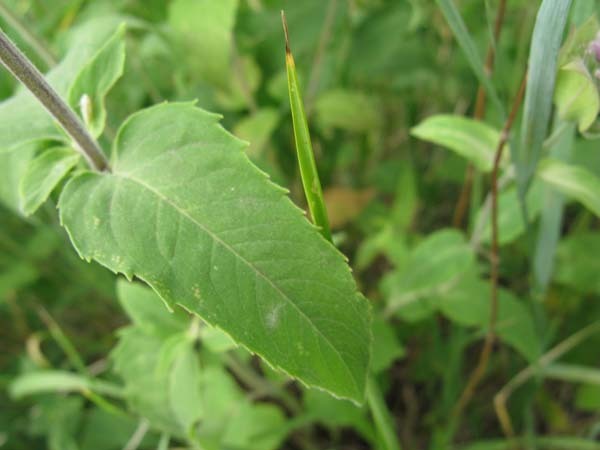 The Ojibwe put a wad of chewed leaves of this plant into their nostrils to relieve headache. The tops of the plant were dried and used as a sternutatory for the relief of colds. The leaves were placed in warm water baths for babies. The Flambeau Ojibwe gathered and dried the whole plant, boiling it in a vessel to obtain the volatile oil to inhale to cure catarrh and bronchial affections. The Menomini also used this plant as a remedy for catarrh, steeping the leaves and inflorescences in a tea. The Meskwaki used this plant in combination with other plants to relieve colds. 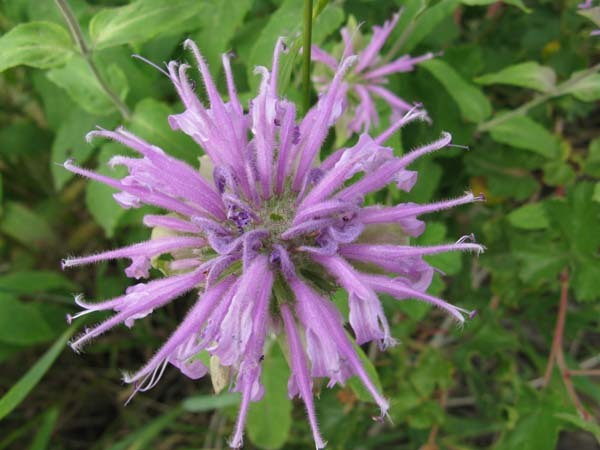 The Hocak (Winnebago) used wild bergamot in their sweat bath and inhaled the fumes to cure colds. A decoction of boiled leaves was used as a cure for eruptions on the face. The Cherokee made a warm poultice of the plant to relieve a headache. 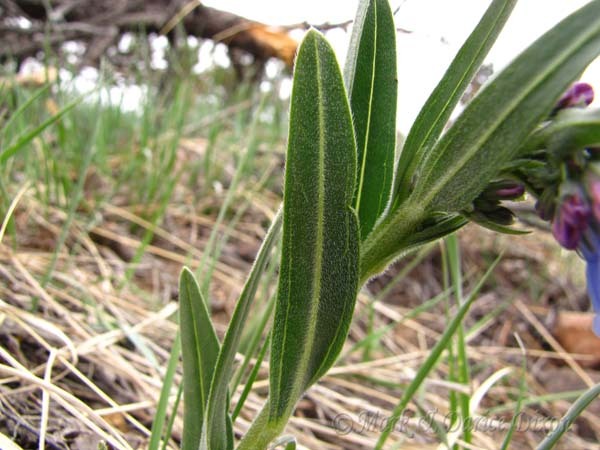 The Teton Dakota boiled together the leaves and flowers as a cure for abdominal pains. The Blackfoot made a tea from the blossoms and leaves to cure stomach pains. They also applied boiled leaves to the pustules of acne. The Tewa dried the plant and ground it into a powder that was rubbed over the head to cure headaches, over the body to cure fever, and as a remedy for sore eyes and colds. Early white settlers used it as a diaphoretic and carminative, and occasionally employed it for the relief of flatulent colic, nausea and vomiting.' End quote. Plant location: Seen in the Rocky Mountain foothills in Colorado state at Hwy 72 and Plainview Road. The date was July 11, 2008. 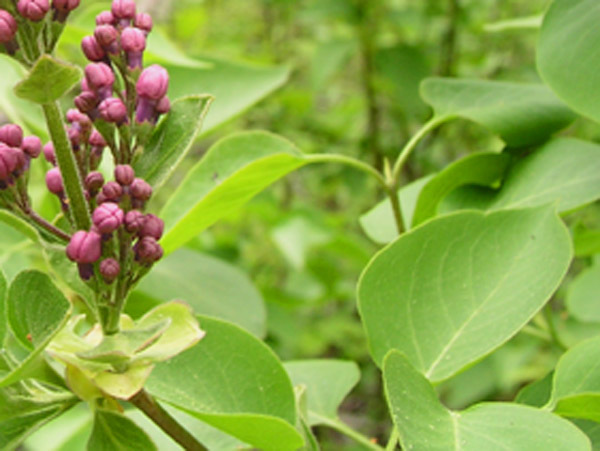 This plant is found in upland woods, thickets, and prairies from Quebec to Manitoba and British Columbia south to Georgia, Louisiana, and Arizona. Bloom period: June through September. These leaves, when crushed, exude a spicy, highly fragrant oil. With it's tall slender configuration of blossom these flowers could be initially mistaken for Foxglove. Until you look down it's throat. There are generous numbers of species to this genus, about 140. It is an immigrant from Europe, Asia, and Africa. This genus has seen it's day of fame in Hollywood. 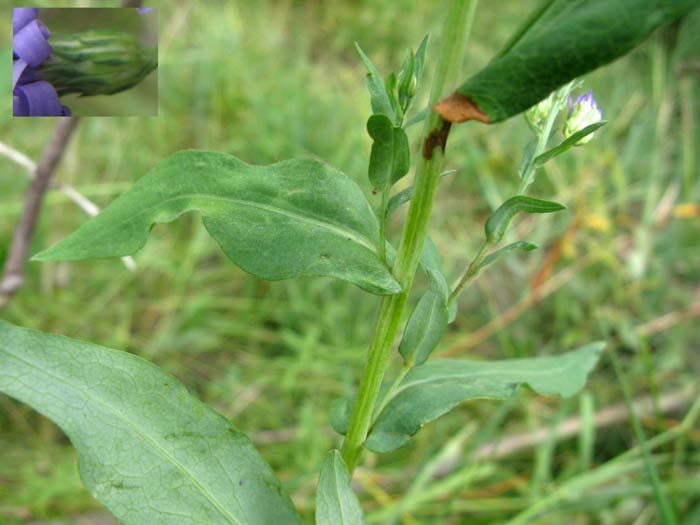 One of the species, Vicia faba, was mentioned as a food delicacy in the movie Silence of the Lambs - the Fava Bean. Something to watch out for with this genus; some of the members produce a seed that resembles lentil. But they are not fit for human consumption according to WIKIPEDIA. They are toxic and have been banned to export to such lentil eating countries, as for example, Egypt and Pakistan. 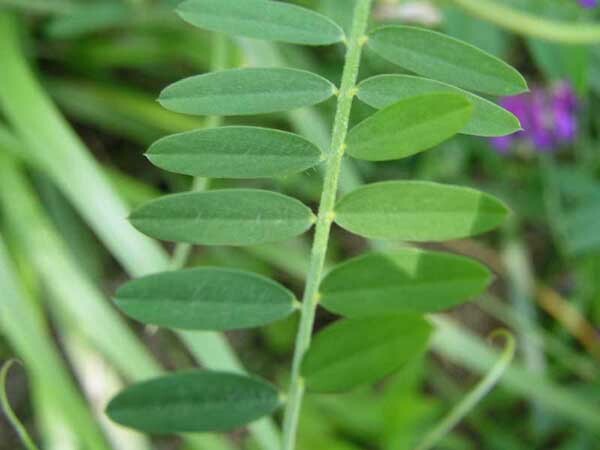 USES: The website Native American Ethnobotany has these records of uses of Vicia villosa by Native Americans: Rappahannock Drug (Dermatological Aid) - Compound infusion with dried leaves taken for sores. Rappahannock Drug (Gastrointestinal Aid) Compound infusion with dried leaves taken for stomach pain. 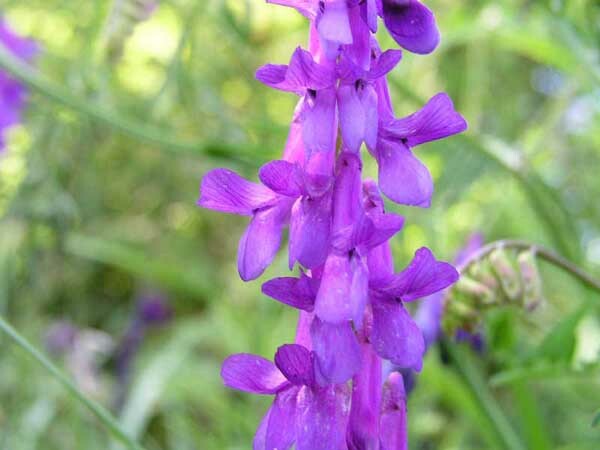 ALSO: Vicia villosa, is cultivated for forage material for livestock and for green manure (an example of fast growing plants that are used to increase the fertility of soil). Both seeds and leaves of this plant are edible. Plant location: Seen in the Larch Mountain-Columbia Gorge Oregon area, early July 2007. Bloom period: Roughly May through July. As attractive as these flowers are, they are said to have a fragrance uncomfortably close to a certain black and white stripped animal. We did not put this to the test, but certainly enjoyed the lovely sight of them. They are known to grow in elevations of 5000 feet to 10,000 feet. 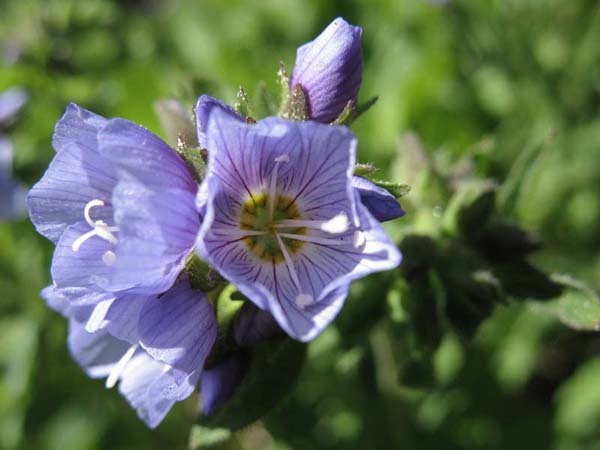 From our research we learned that there are only about 25 species of Polemonium that flower. There are known species in the Andes mountains in South America. More photographs of Showy Jacob's Ladder here. USES: From the website Native American Ethnobotany the Thompson Indians used a decoction of the plants as a wash for head and hair. The flowers can be deep shades of blue to almost white. It is native to western North America from Alaska and Yukon to Arizona and New Mexico. It is said that a war was once fought over who discovered this species. Plant location: We saw this specimen in the Mt Rainier, Sunrise area, on July 7, 2007. The species is found in the following locations in the United States and Canada: USA (AK, AZ, CA, CO, ID, MT, NM, NV, OR, UT, WA, WY), CAN (AB, BC, NT, YT). Bloom period: a short show, July and August. 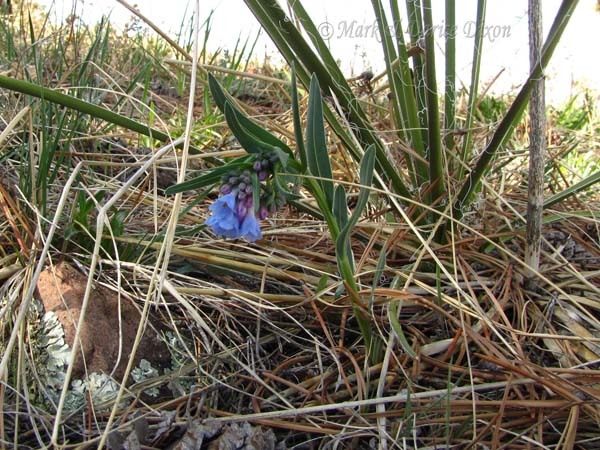 This Mertensia species presents a few challenges to identify at first glance. The flowers are similiar to other Mertensias that we have found and need to be examined carefully to determine 'who' they are. One main characteristic is the style (Weber defines this as the slender upper part of the carpel) projecting farther than the anthers. See this on the additional photographs page of this species, here. However, Weber's keys also point out that the species is variable and complex, merging and re-combining in puzzling ways. For example the limbs and lobes of the flowers may or may not be widely spreading. The plants are also known to grow at varying elevations and could be separated into alpine and lowland members. Lanceolata is similiar to brevistyla. 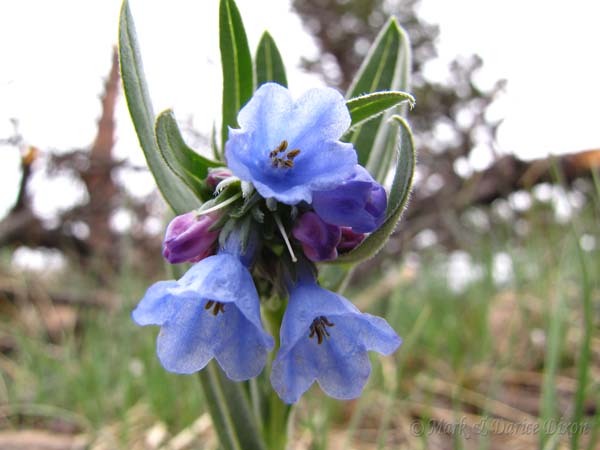 There are roughly 18 species in the genus Mertensia, with the following varieties of lanceolata: brachyloba, coriacea, lanceolata, secundorum, fenderli, nivalis, pubens, and viridis. Plant location: Plainview Road (Golden Colorado) on April 20, 2010. The elevation was 6502'. GPS coordinates: N39?52.735 W105?16.217. 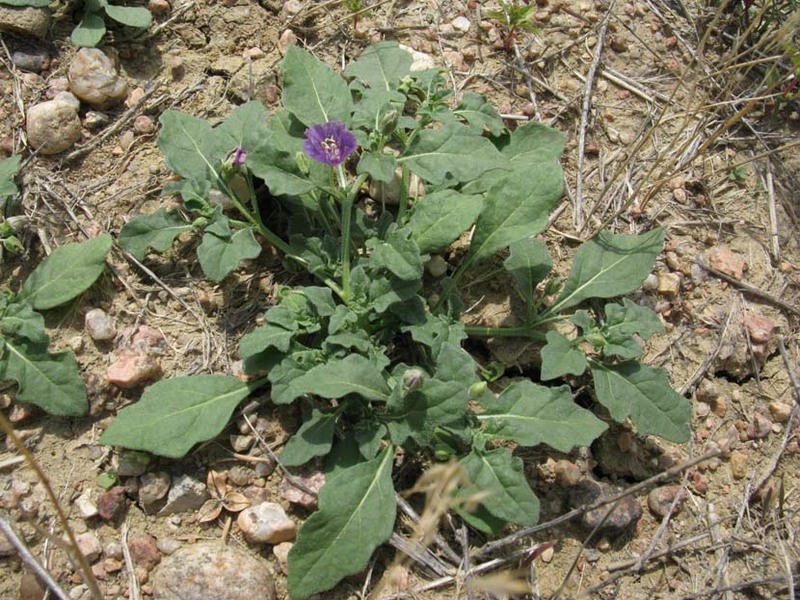 Many plants are in the area, low to the ground, with an average height of 3 to 5" tall. In the USA: (CO, MT, ND, NE, NM, SD, UT, WY), and Canada: (AB, MB, SK). Bloom period: Early spring through about June. See WIKIPEDIA for a detailed account of the changes. We mention both genus since many websites are not yet noting the move. The key used to identify this plant was from Colorado Flora Eastern Slope by Weber and Wittmann. 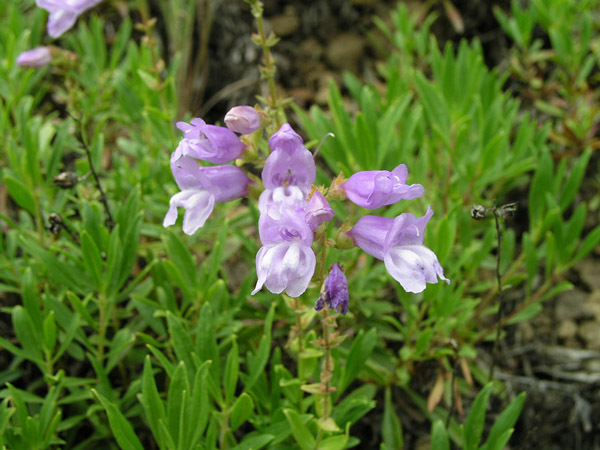 According to the USDA Plant database, this species of Penstemon is found in only 3 states; Colorado, New Mexico, and Wyoming. It is a perennial herb that is native to the continental United States. 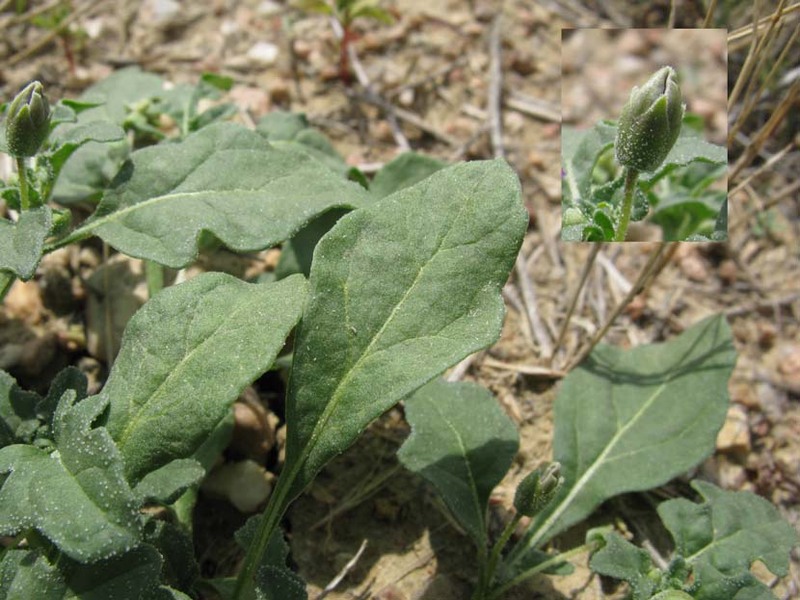 This plant is similiar in appearance to Penstemon Unilateralis. However, the foliage in the unilatralis is distincly more narrow than secundiflorus. 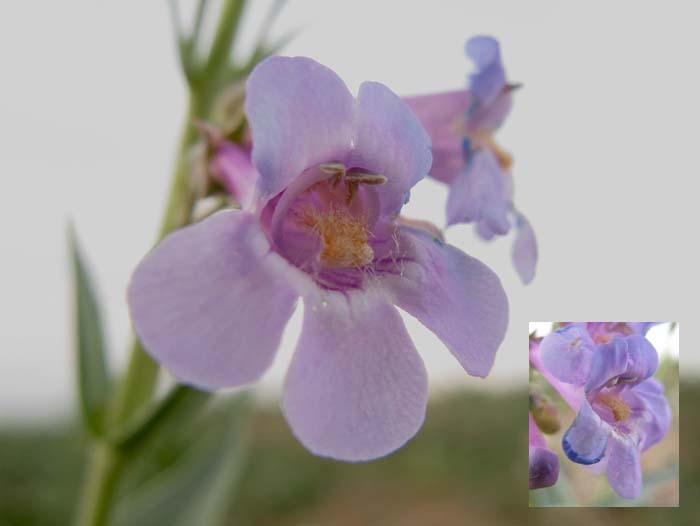 Per WIKIPEDIA on the genus Penstemon: They have opposite leaves, partly tube-shaped and two-lipped flowers and seed capsules. The most distinctive feature of the genus is the prominent staminode, an infertile stamen. The staminode takes a variety of forms in the different species; while typically a long straight filament extending to the mouth of the corolla, some are longer and extremely hairy, giving the general appearance of an open mouth with a fuzzy tongue protruding and inspiring the common name beardtongue. 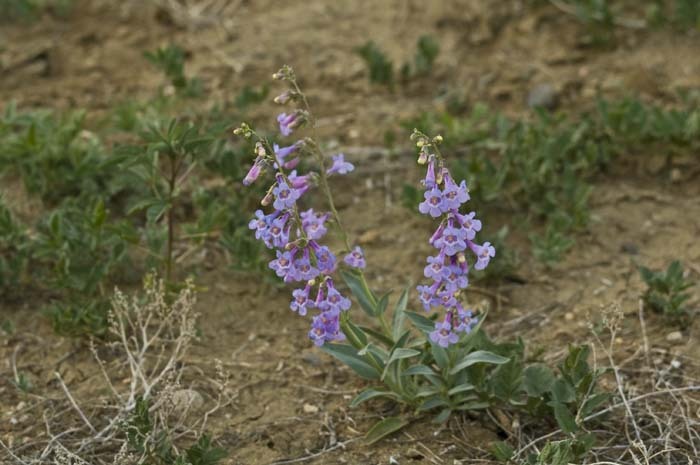 USES: In North America, penstemon species are often used in Xeriscape landscaping, as many are native to desert or alpine regions and thus quite hardy. One of the largest collections of penstemon species in North America is found at The Arboretum at Flagstaff, which hosts a Penstemon Festival each summer. Some seed companies sell this species as a hummingbird attractor. Additional photographs of Sidebells Penstemon seen in the Rocky Mountain National Park on May 27, 2009. Plant location: Big Dry Creek Open Space, Westminster Colorado - May 25, 2008. Bloom period: commonly a short bloom time, April and May. According to the USDA Plant Database there are approximately 90 species in the genus Symphyotrichum. 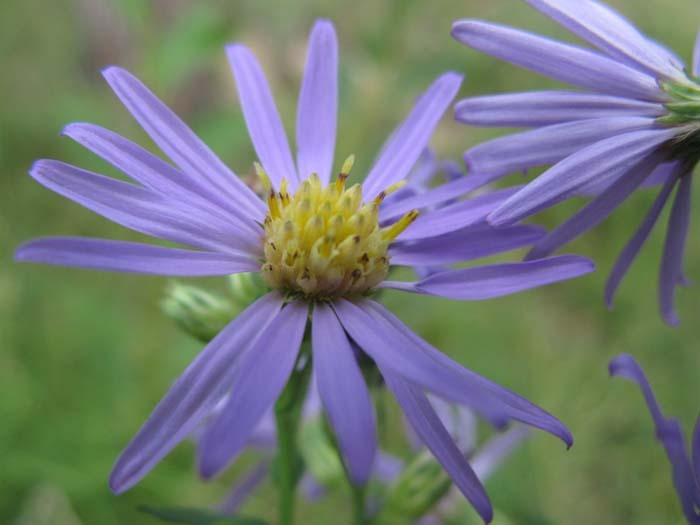 William Weber, in his book Colorado Flora Eastern Slope, speaks of the ambiguous state of the nomenclature of Asters. He does not list any species of the genus Symphyotrichum in Colorado. Per WIKIPEDIA: 'The majority are endemic in North America, but several species also occur in the West Indies, Central and South America, as well as in eastern Eurasia. Furthermore, many species have been introduced to Europe as garden specimens, most notably the New England aster and the New York aster.' End quote. 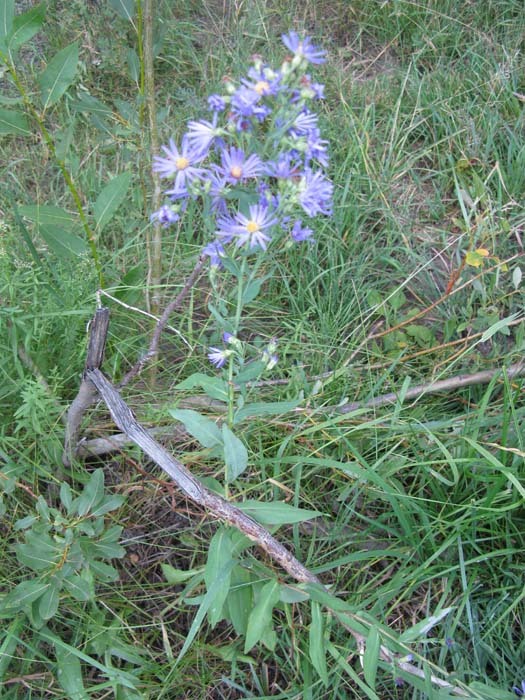 There are four subspecies of Smooth Blue Aster; laeve, concinnum, geyeri, and purpuratum. Not certain which this example is. 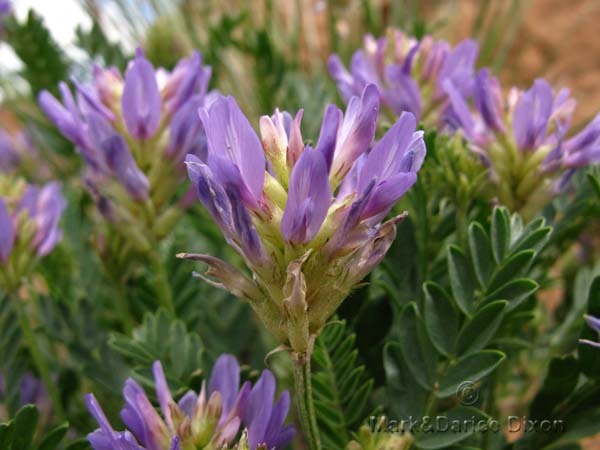 USES: The website Native American Ethnobotany has a number of uses by Native American tribes on record for this plant; 'var laeve - Meskwaki Drug (Herbal Steam). Entire plant used to furnish smoke in sweatbath. var laeve - Meskwaki Drug (Stimulant). Smoke forced into nostrils of unconscious patient to revive him. var geyeri - Keres, Western Food. Flowers mixed with parched corn and eaten. var geyeri - Keres, Western Dye. Flowers mixed with white clay and used to dye wool or eggs. var geyeri - Keres, Western Other (Paint). Petals mixed with whitewash.' End quote. Plant location: Seen in the area of Creedmore Lakes, Colorado, on August 31, 2008. This is one widespread plant. It blankets the United States and much of Canada. Bloom period: Unknown. This species is a perennial herb/forb. The phyllaries of this species is smooth and looks matted together rather than curly or fingered.